Solar panels at an off-the-grid straw-bale house catch rays near Panther Peak just outside Saguaro National Park west of Tucson. I was only going to have one beer at the Buffet Bar, Tucson’s famed dive bar in the historic Iron Horse Neighborhood. It was late morning. But then I started talking to Art across the corner of the bar. It’s a friendly place. I soon learned Art was born in Tucson a few years after the end of World War II. He was raised in tough neighborhoods in East LA and then on the gentler streets of Phoenix, before returning to Tucson. Art said he was going to play in an annual chess tournament the next day at Hotel Congress. This was Friday and he was shooting pool and having a tall can of Budweiser ($2.50) in the dark Buffet Bar. It’s the kind of place Bukowski would drink in if he was still around. Art put Ray Charles’ Mess Around on the jukebox. I ordered another beer and learned about previous Buffet Bar owner Ted Bair and Miss Peggy, the bartender, who didn’t allow cussing in there. She passed a few years ago and her ashes are now in a Foster’s can on the back bar. That was her beer. This was her bar. On this late spring day, Cindy the bartender had a full-size poodle wandering around the patrons, including the old guy with a red athletic jacket and a lush toupee. 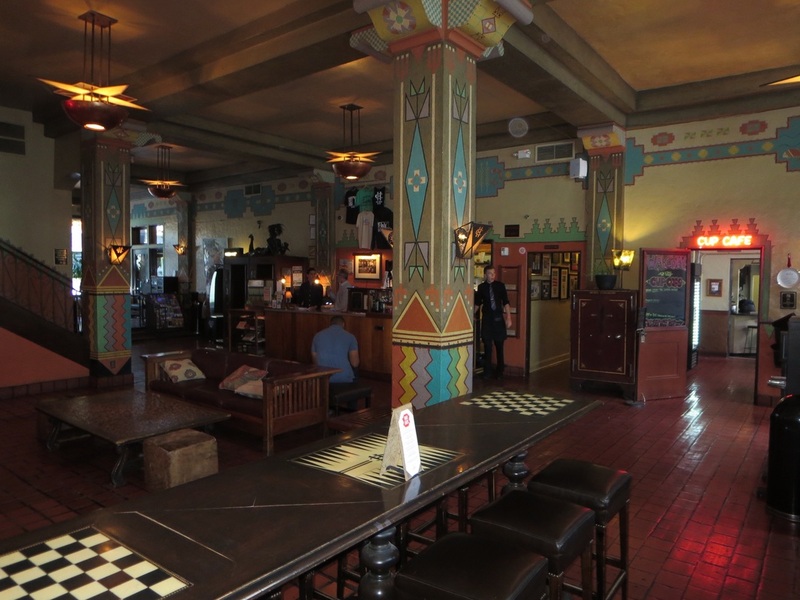 Esquire named Buffet Bar one of America’s Best Dive Bars in 2013. I had it on my list to visit. 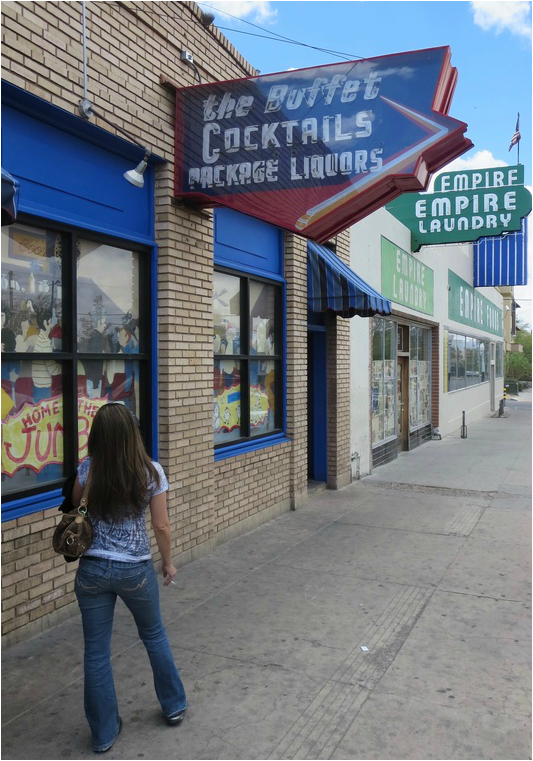 The Buffet, 538 Ninth St., opened after Prohibition ended in 1934 and it's one of Tucson's oldest bars. I stumbled across it while exploring lower Fourth Avenue and the pink Coronado Hotel, which like a lot of vintage hotels in Arizona needs some paint and expensive TLC. Earlier, I enjoyed a latte in a Fourth Avenue coffee shop near a Sun Link streetcar stop. I stopped in at a great bookstore, Antigone Books, at 411 N. Fourth Ave. and found a book I had to buy: “Chasing Arizona” by Ken Lamberton. That seemed appropriate since that’s what I was doing in Tucson. Over the decades, I’ve only spent a few days here and there in Tucson but passed through so many times. I always find it to be a great change of pace from the hustle-bustle of the spreading Phoenix metroplex. This was a two-day visit to look deeper into the city to find its character. I wanted to find the house where gangster John Dillinger was arrested by Tucson police in 1934. ​ Dillinger and his wise guys were rousted from the Hotel Congress because of a fire. Someone thought Dillinger looked familiar. So Tucson’s finest did what the FBI and other police departments failed to do. They caught Public Enemy No. 1. I found the house at 927 N. Second Ave., It’s an unremarkable bungalow in one of many Tucson neighborhoods with generally well kept historic homes. I also found an abundance of street people along Fourth Avenue and in Tucson’s small parks. Other down-on-their-luck guys were out at former Miracle Mile hotels renovated for homeless housing. A key reason for my Tucson visit was to see what remains of Miracle Mile hotels and the vintage neon that tantalized Arizona travelers before Interstate 10 rerouted them to newer chain hotels with boring back-lit signs. Buffet Bar, which opened in 1934, is one of Tucson's oldest bars. At night, the Miracle Mile lights up with a black and white sign at Ghost Ranch Lodge, Terrace Motel and more colorful neon at the Monterey Court, Tropicana Motor Hotel and others from the era. The Miracle Mile sign itself -- a towering saguaro -- is a fitting landmark along the Mile. Downtown Tucson also has cool neon at the Hotel Congress, Rialto and Fox theaters. I stayed at the nicely restored Royal Sun Inn, a Best Western that includes a vintage coffee shop redone with a Midcentury Modern design, colors and lighting fixtures. Peeling back some of Tucson’s layers opened my eyes and made me want to explore more of the city. There's much more to see. On previous visits, I’ve enjoyed both sections of the Saguaro National Park that bracket the city. It includes some of the prettiest Sonoran desert one can find and the densest stands of tall saguaros. I also stopped on the way out of town at the Catalina State Park, which looks to be a great camping spot at the foot of the Santa Catalina Mountains. Another spot to enjoy the Sonoran desert is Sabino Canyon in the Santa Catalina Mountains. It's got hiking trails, a swimming hole and shuttle bus to scenic overlooks. Take Tanque Verde Road or Sunrise Drive to Sabino Canyon Road in northeast Tucson. 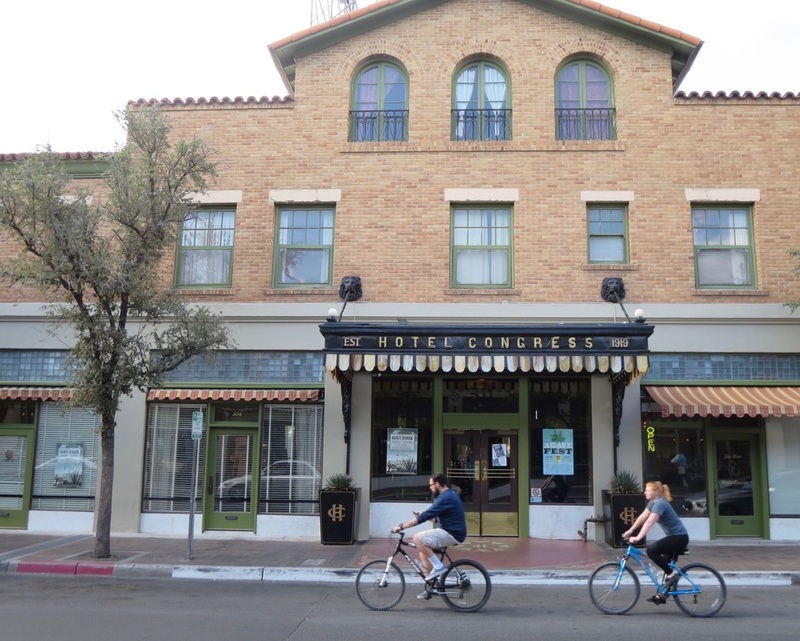 Guests at Hotel Congress can enjoy the lobby, Cup Cafe or the Tap Room bar that features paintings donated by artist Pete Martinez, a former patron. Terrace Motel, with its Mayan pictograms, dates to 1949. 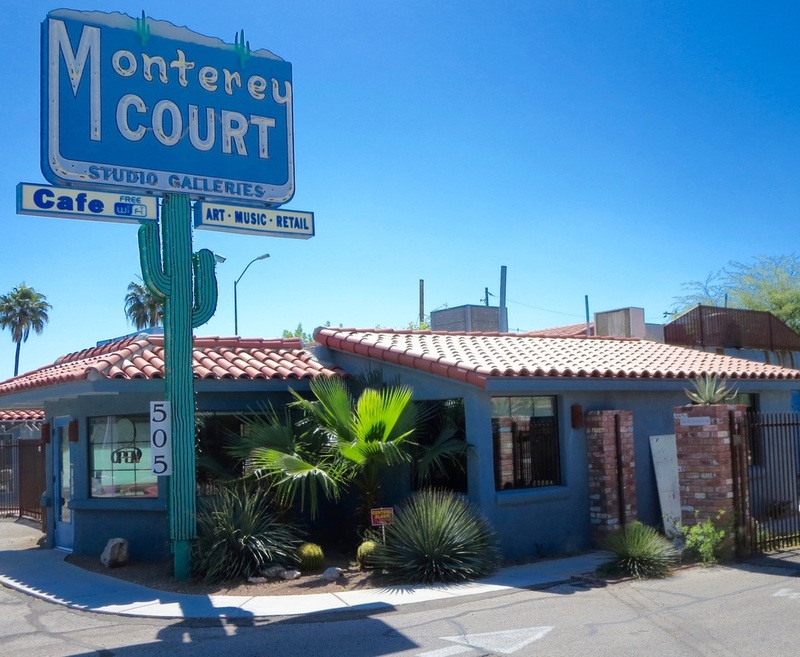 Monterey Court from 1938 is a cafe, bar and music venue. 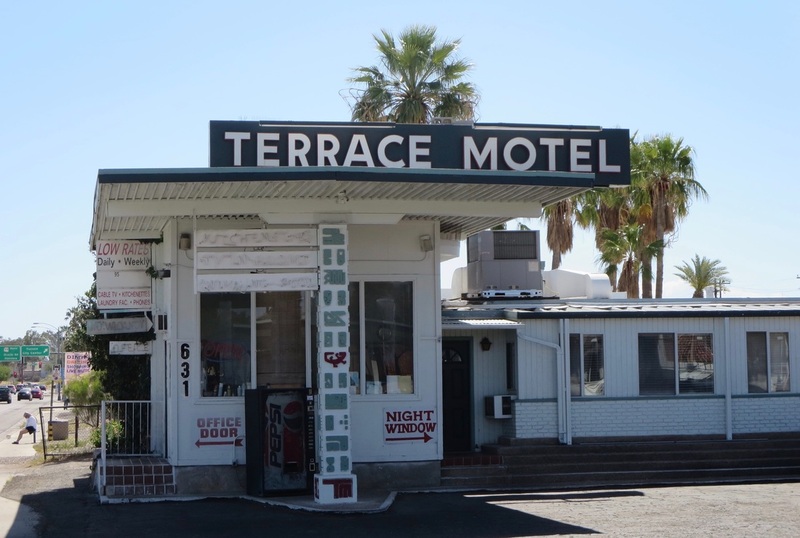 Tucson's Miracle Mile emerged as the tourist route through Tucson with beaming neon and courtyard motels. 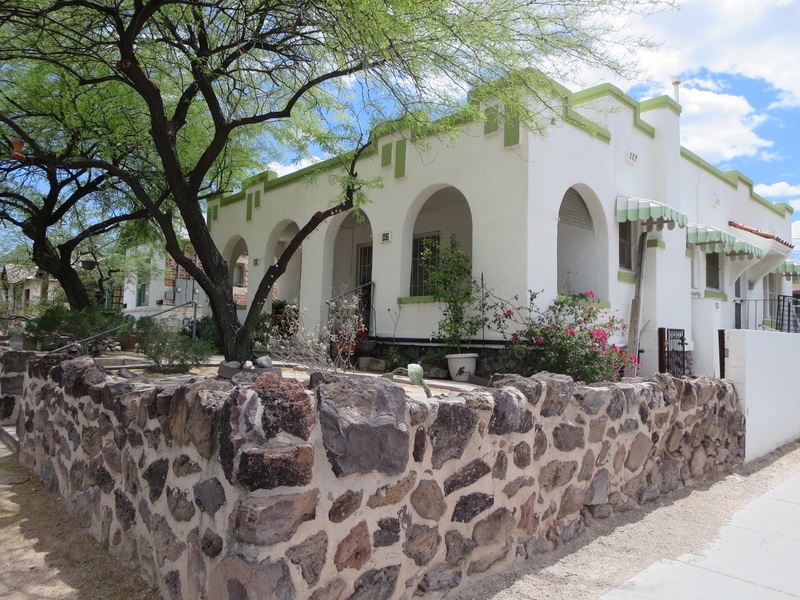 Tucson is full of well-tended historic homes like this one in the Iron Horse neighborhood north of the train depot. Arizona sheriffs relied on the rugged, high-clearance Studebaker Six to patrol in the mid-1920s. Tucson to Yuma was a three-day trip on a stagecoach like this one at the Arizona Historical Society Museum. Clouds pile up over the Santa Catalina Mountains near the Catalina State Park north of Tucson.